Comodo CA (Certificate Authority), the company behind Comodo SSL certificates, was acquired by Francisco Partners one year ago. After the acquisition the Comodo CA branding remained extremely similar to Comodo, their former parent company. That was until now.. The new owners have renamed the company Sectigo! The rebranding was always inevitable because the names were too similar. There was some confusion between Comodo CA (the SSL certificate business) and Comodo (who continue to offer anti-virus and security products). Now we can be clear that we offer a range of Sectigo SSL certificates, including Positive SSL, Instant SSL and EV SSL. Pricing and service will remain the same. 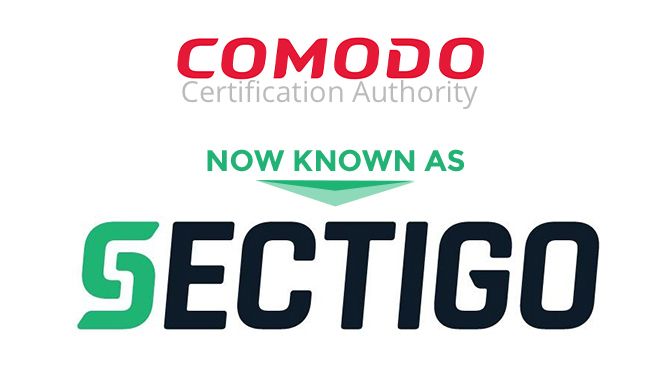 Sectigo is still the same company that has over 20 years of industry experience and the largest market share of any CA (Certificate Authority). It’s still the same company that has issued over 100 million SSL certificates globally. If you have any sales or technical questions regarding SSL certificates, from Sectigo or another provider, please don’t hesitate to contact our team.